A million years ago, in the time before food TV, food blogging, and pop-ups, my then-apartment-mate and I held weekly Sunday dinner parties in the spacious dining room of my roomy Cleveland Heights, OH apartment. The guest lists and menus were different every week, and the point was interesting food and conversation on what was usually a nothing night in the CLE. One week we did a traditional (and pork-tastic) soul food dinner from scratch. Another week we made an all-vegetarian meal. A splendid time was always had by all. Leading up to the Sunday that had inspired this post I had been fired up by memories of a trip to New York and The Coffee Shop Restaurant. On my visit to the Brazillian-American late night spot the menu there had offered a special that had appealed to my soul food-loving heart: Brazillian-style feijoada. The flavors of the black beans, salted pork trimmings, smoked sausage, and I-wish-that-I-could-recall vegetables, served over white rice with orange slices comforted me like a hand stroking my head among the metropolitan intensity of the pre-Giuliani NYC that I so loved, but that was sometimes too much to bear. Two days before that Sunday dinner party I'd also been thinking about having been slapped around by tacos and burritos I'd experienced on then-recent trips to San Francisco. Tacos that were ... tacos ... and weren't the product of the dog food-dishing chain (Is that description ringing any bells?) I'd grown to loathe throughout my frozen Northeastern Ohio upbringing. So, fueled by food experiences from two coasts, I grabbed the wheel of the taco truck and took it off-roading. What was the result? 1) Flour tortilla, 2) Feijoada 3) Crisp spinach leaves, 4) Crumbled feta, 5) Major Grey's mango chutney. These were not the tacos my Ohioan guests were looking for, but they were good. My guests may have been confused by them, but they gushed as they eagerly cleaned their plates. I'd paired them (pairing? what?) with Xingu. 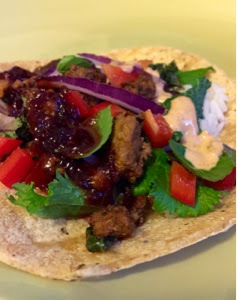 Because, Brazillian-inspired taco filling and Brazilian black beer. Of the many slogans this blog carries, the one that I think communicates the most about what yours truly and Doc Gus are trying to say is "Play With Your Food". Food, like people, like language, should grow and change. 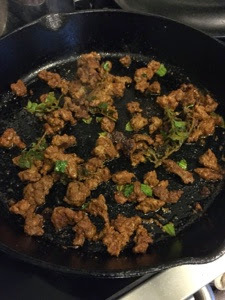 To say that a taco should be the taco you know ... well, they aren't. Like the sandwich, which I have seen Doc Gus argue that the taco is, tacos are varied in fillings throughout their native land and beyond. The first sandwich was "bits of cold meat" between slices of bread. What if the sandwich was stopped there? I'd be deprived of one of my favorite sandwiches: Sliced Granny Smith apple, sweet hot mustard, and double creme brie on baguette*. Is a taco a sandwich? Is a gyro? What about a shawarma? Arguable. Arguable. Arguable. Is a wrap a sandwich? I'll slap you. Wraps are marketing. My point is, however, that you can monkey around with the concept. 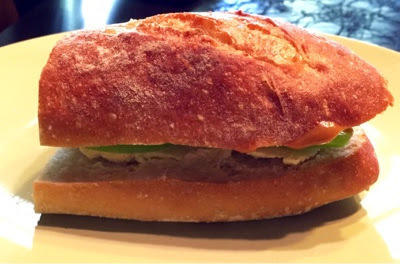 Besides, at least in Mexico, a torta IS a sandwich. 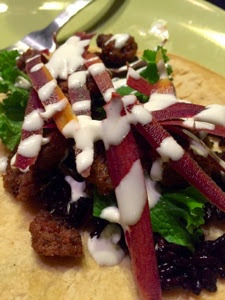 So, remembering those tacos of the past, I messed around with the taco again. 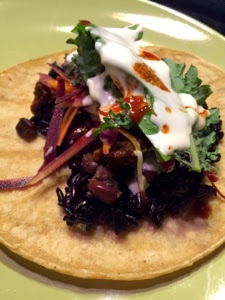 This time it was with black rice, black beans, shaved purple carrot, mustard greens, kale, sacred basil and purple shiso flowers, seasoned grass-fed beef (fresh oregano, culantro, and sacred basil from the garden, garlic powder, smoked paprika, sage, turmeric, sea salt), "sour cream" (two parts Greek yogurt to one part Trader Joe's organic mayonnaise), and, on alternating tacos, my home made habanero hot sauce or my beloved Tapatio. What a flavor-filled bite! Of course, you don't have to get so crazy to be adventurous. Recently, I stuck a little closer to home with jasmine rice, seasoned grass-fed beef (fresh oregano, ground cumin, garlic powder, smoked paprika, salt), baby mustard greens, baby kale, red bell pepper, red onion, cuban beans, jalapeño chutney, and sriracha "sour cream". Again, a tasty treat. What's my point? Maybe "don't be boring"? Maybe "have fun"? Definitely "play with your food". Even if you think that a taco is no more a sandwich than a Kangaroo is vodka martini, you can call it whatever you'd like, just don't call me late for dinner. Okay? Okay. Perhaps my real point is this: A lead-in to my next project. I've been kicking this one around for a while and now that I have a good source for goat meat it's about to happen. At the moment I only know that it's going to be a chalupa shell filled with seasoned goat meat, nopales, "sour cream", some of the Scotch Bonnet (100,000-350,000 Scoville units) and Black Cobra pepper (20,000-40,000 Scoville units) sririacha I'm putting together, and perhaps cabbage and an as-yet-to-be-determined bean. I'm calling it the Chalupacabra after the "goat sucker" of myth. It's going to be fun. I can't wait. Have fun, Chowbaccans. Play with your food. *H/t to the long-gone Apple Deli, but I had to replace the havarti with double-cream brie. Because, double-cream brie.